Are these the words that Bettman wants to make a reality? Every day with no news makes it seem as though he’s that much closer to making it so. Dollars and sense. Economic issues seem to be the main focus of Tuesday’s meeting between the NHL and the NHLPA executives. Rumor has it that the NHL will be presenting a new proposal. The question remains whether or not the two sides can come together before economically September 15th. Both sides are looking to make progress in negotiations as the deadline looms. 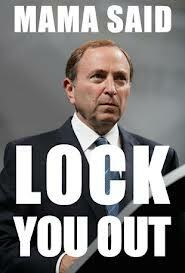 No one wants to hear the word ‘lockout’ uttered by Bettman. I really truly do loathe that word and all that comes or does come with it. Bettman’s legacy during his tenure as NHL Commissioner will be the 3 lockouts rather than advancements in the game, everyone will remember him stalling its progress 3 times. Time will tell whether he’s willing to take the gamble that could make or break apart the league its many fans. Will the fans return? Probably…but it will have nothing to do with Bettman calling us ‘the best fans’. It will be because we want to see their team and favourite players play the game again. I hate when Bettman makes suggestions to how the fans will respond because how can he know when he never HEARS us? We do not want the lockout….and should it happen….there will be MANY calling for him to be replaced. Keep your fingers crossed as this next round of CBA negotiaton begins and that real progress is made this time because otherwise we will all be stuck watching ESPN classics until the lockout is ended or worst case scenario until October 2013. Let’s all hope that does not happen. In other news the Vancouver Canucks announced the re-signing of goal-tender Eddie Lack to a 2-year contract. He has spent the last few seasons playing with the Canucks AHL affiliates[The Manitoba Moose/ and current Chicago Wolves]. He seems pretty happy to return to the organization, we shall see how impacts the team whether it is with the Wolves or the big club next season. Talks are ongoing between Burrows and the Canucks regarding his extension. A lockout may be looming and the Phoenix Coyotes may not have all their ownership issues in order but one thing is certain. Shane Doan will indeed sign a new contract prior to September 15th deadline. Question marks are surrounding the Philadelphia Flyers and their fading blue-line…with all eyes waiting to know one way or the other if Pronger can or cannot play again. Philly has lost many of its rear guard to injury or free agency, but the biggest loss to their defence is the concussion that has sidelined Pronger since early last season. It would be an enormous void to fill should Pronger not be able to return. Time will tell. This entry was posted in 2012 Lockout, Hockey, NHL, Vancouver Canucks and tagged Bettman, hockey, lockout, NHL CBA, Vancouver Canucks by sarahlaug. Bookmark the permalink.